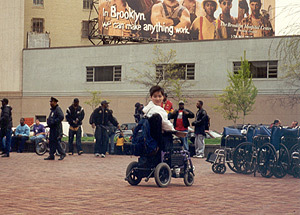 An urban campus located in downtown Brooklyn serving students of diverse backgrounds and needs, LIU’s Brooklyn Campus has a long history of welcoming and supporting students with disabilities. The Charlotte W. Newcombe Foundation has partnered with LIU in offering support and encouragement to these students, granting more than $640,000 for scholarships and assistive support since 1983. The Foundation values and celebrates LIU’s long-term commitment to recognizing and responding to the challenges, ambitions, and needs of students with disabilities. In 1967, Long Island University-Brooklyn Campus was one of the very first institutions to open its doors to students with disabilities. Since then, LIU has recognized that students with disabilities and special needs are entitled to participate in higher education and achieve personal growth in an environment that is welcoming, supportive, and relatively barrier-free. In the early 1970’s, Theodore Childs, the Director of Special Education Services at that time, hired three talented staff members: Jeffrey Lambert, Robert Nathanson and Ellen Nuzzi, who all have been long standing service providers and advocates for students with disabilities on the LIU-Brooklyn Campus. Since then, the Special Educational Services Program, now Student Support Services, has not only been a source of great pride for Long Island University, but has also been a nationally recognized model for other colleges and universities. Since their arrival on the Brooklyn Campus, students with disabilities have been fully involved in all aspects of campus life. They have held numerous student government offices and have been members of almost every campus club and organization. Several have graduated with the highest possible academic honors and have impacted the lives of many others during their careers. One example is Judy Heumann, one of LIU’s first students to attend with a disability. She graduated in 1969 and began to teach in the New York City Public Schools, the first teacher in the system who used a wheelchair. Her determination as an educator led to her appointment as Assistant Secretary, Office of Special Education and Rehabilitation Services at the US Department of Education. She served in the Clinton Administration from 1993 to 2001. Section 504 of The Rehabilitation Act of 1973 was written after federal officials spent several days on the LIU-Brooklyn campus asking staff and students for input into the new law. With the advent of this significant Act, LIU’s disabilities services evolved into what they are today, serving students with physical and other disabilities. David Dopico was one of LIU’s disabled students when a class action suit, Dopico vs. Goldschmidt (1982), led to legally-mandated access to mass transportation for mobility impaired individuals. People who live their lives without disabilities are often unaware of the talents and abilities of individuals who spend each day coping with a disability. In response, students at LIU started a club called SNAP (Student Needs Action Program) that is dedicated to disability awareness. Every year for the last twenty years, LIU has organized a “Great American Race” held every spring on campus where able-bodied members of the campus and community get into a wheelchair and are challenged to follow a prescribed course. The course includes stops at various stations that allow participants to learn about visual impairment, deafness, learning disabilities, health issues, disability awareness issues and of course, mobility impairment. 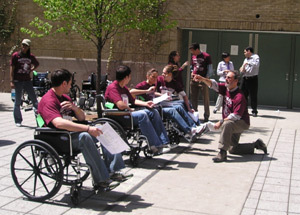 Race participants are required to maneuver their wheelchairs using ramps to enter campus buildings, open heavy doors, wait for space in elevators, use a bathroom that is not designed for wheelchair accessibility, and pick up an object from the floor. At one station, words are jumbled to simulate the difficulty experienced by a student with dyslexia or other learning disabilities; at another, garbled audio simulates hearing impairments. Participants are challenged to use Kurzweil technology or Dragon Naturally Speaking software to experience how students with visual or learning disabilities cope with academic situations. This event is designed to increase the sensitivity of able-bodied participants toward fellow students, faculty and staff who have disabilities. In addition, the SNAP club has invited guests from area corporations to participate, with some success. By reaching out to the community beyond the campus, this project hopes to raise awareness of issues faced by people with disabilities within the general community and among prospective employers. This Great American Race offers students in health sciences, education, psychology and other human service majors, as well as faculty and staff, a hands-on experience with various disabilities. The participants come away with a renewed understanding of what it means to be disabled and what it takes to accommodate people with disabilities. This program helps non-disabled students relate to disabled students and to respect and appreciate what disabled students can and cannot do. Several local businesses contribute prizes and financial sponsorship to support the Great American Race each year. The event ends with prizes awarded to the three participants who successfully complete the course with the fastest times. Although there have been some recent staff changes, the commitment to providing support services to students with disabilities remains unchanged. Through the encouragement of Diana Voelker, new Director of Student Support Services, the Great American Race is continuing as an annual event. The Student Support Services staff is very proud of LIU’s students with disabilities for all of their accomplishments. The University and its students and staff have come a long way in offering equal access and support to students with special needs. With the help of supporters like the Charlotte W. Newcombe Foundation, these students will continue to receive high quality services. For further information please visit LIU’s website: www.liu.edu.